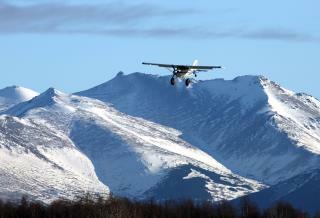 (Newser) – It's about as scary as it gets when it comes to air travel: Police in Alaska say a 16-year-old boy grabbed the controls of a small commuter plane and sent the aircraft into a steep climb, followed by a steep dive, before a female passenger subdued him, reports the Daily News-Miner of Fairbanks. The pilot then retook control of the Piper Cherokee 6 and landed it safely. The teen ran away upon landing, but police arrested him the following day. His motive for the stunt was unclear. Um, the 'front passenger seat' is the copilot seat. Is a Cherokee 6, folks. Was the stewardess giving the pilot a hummer so his hands were caught in her hair? It's not like the co pilots seat is in the back of the plane. Guess this means TSA agents won't let you take TWO hands onto any more planes.